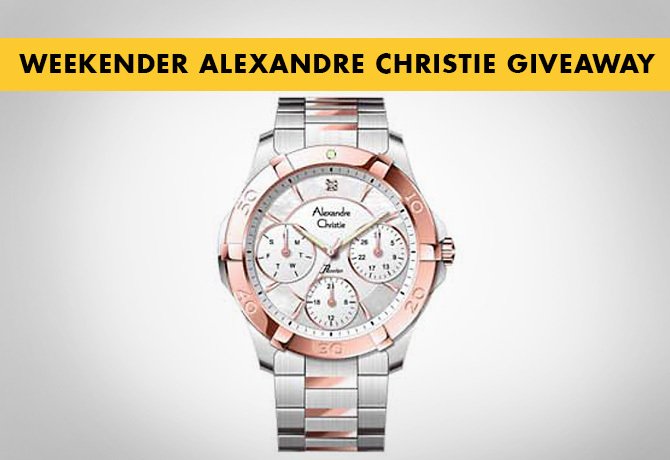 An Alexandre Christie 2445-BFBTRSL watch worth $200 to be won! The heaviest of the lot, the 2445-BFBTRSL model is for the power woman. Thicker and bigger than the rest, this timepiece is heavily tinted in rose-gold and immediately striking. The wide watch face offers greater spotlight on the three dials in the background, allowing the wearer quicker access to a complete time and date check. Win one for yourself now! ONLY 1 ENTRY PER PERSON, PLEASE. GOOD LUCK! I would like to win the 2445-BFBTRSL for myself to keep me with the time !!!!! Stylish looks cool inside out. will love to win this lovely watch for Christmas!! I will love to win this watch for Christmas! this watch is every lady dreams! Love this Classic Watch, Hope to win as a Birthday Gift for myself! Like, share and tag my family and friends for a chance to win An Alexandre Christie 2445-BFBTRSL watch!! Lovely Watch hope to win!!! OMG!!!!! Im in love with it! Hope to win this lovely watch. I want to give this gift to my sister. It would be nice if I have one. love this watch. hope to win this. Me will be the lucky one!!! Hope can win this beautiful watch.